OXFORD, Ohio – A young Miami team learned a hard lesson on Friday. 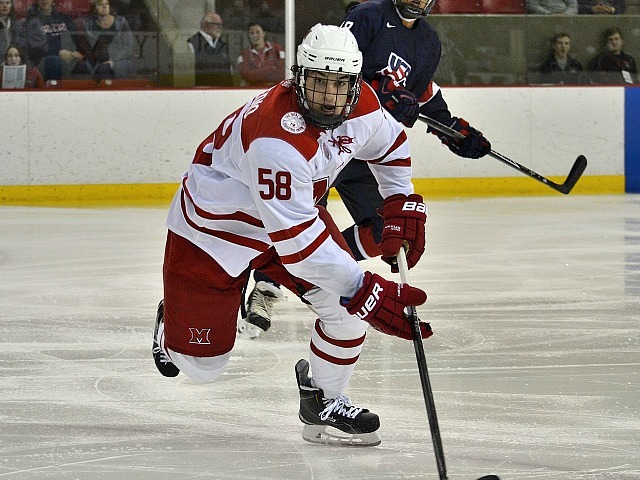 Playing 15 of a possible 60 minutes will not earn you many wins against NCHC opponents. The RedHawks were lackluster in the first period and the final 25 as they squandered a three-goal lead, falling to Nebraska-Omaha, 6-4 at Cady Arena. More specifically, it was Miami’s defensive play that did it in during its NCHC home opener. In the first period, UNO players were left open via the backdoor cut multiple times, and the goal the Mavericks scored was on a tip-in by an uncovered player at the edge of the crease. The latter point is one we’ve seen used a lot by opponents recently. Miami goalie Ryan Larkin has pro-level reflexes, and one of the hardest things for any goalie to defend is the redirection. Three times the RedHawks were scored on by shots from the blue line that were altered down low by players that were not adequately defended. The other three were the direct result of turnovers, which is a major concern 10 games into the season. Passing has not been this team’s forte but it was believed that area would improve as the season progressed. After Saturday’s game we’ll be a third of the way through the regular season, and Miami’s turnover total on Friday would make Pillsbury envious. Miami captain Louie Belpedio (Cathy Lachmann/BoB). Captain Louie Belpedio missed his third straight game with a lower-body injury, and it’s become obvious how important he is to this team. The RedHawks are allowing 5.67 goals per game during his absence, which not only is a huge loss because of his two-way play out of his defense spot, but we see how key his leadership is. The good news on that front is he should return next weekend. That should help stabilize both the blue line and the team in general. And yeah, we can talk about growing pains, 14 freshmen, etc., but Miami was up three goals in its own building halfway through Friday night’s game. Surely even a freshman-laden team can close out a win up 4-1. This team has been together for a month and a half, working hard in practice almost every day. Yes, the process still supersedes outcomes to some degree, but there’s no reason why Miami can’t still continue to learn while enjoying success in the win-loss department. Quality teams do this all the time. It’s reloading vs. rebuilding. This schedule was set up for Miami to have early league success before facing the truly elite in the NCHC. Western Michigan is receiving votes but is not ranked and has scored seven goals in three conference games against teams other than Miami. The Broncos lit the lamp 11 times vs. the RedHawks last weekend. UNO is getting fewer votes in the polls than WMU but was able to chase MU goalie Ryan Larkin, something no other team has done this season. If Miami is having major struggles against these teams, how will it fare against No. 1 Minnesota-Duluth, No. 2 Denver, No. 6 North Dakota and No. 13 St. Cloud State? To the Mavericks’ credit, they took every advantage of Miami’s miscues and turned the game around on a shorthanded goal late in the second period. They carried that momentum into the third period and added four more unanswered goals. Weak third periods have been a recent trend for the RedHawks, who have been outscored, 13-6 in 2016-17 and 9-0 during their current four-game losing streak. This Miami team that showed so much promise early is in a definite funk, and it needs to get out of it before it gets buried so deeply in the NCHC standings it can’t find its way out. – Let’s start with a positive. Kiefer Sherwood played some of his best hockey of the year in the second period. Sometimes teams have been able to shut him down, but UNO had no answer for him in that frame, as he was able to control the puck, generate several excellent scoring chances and set up others. He’s becoming a dominant player in this league. – One reason for the key problems for Miami during its skid is its penalty kill. Tops in the NCAA through six games, the RedHawks have surrendered seven power play goals in the last four games, going just 18-for-25 (72.0 percent). – Even with a semi-strong student presence, attendance only reached 3,002. Many of those fans headed for the gates during the TV timeout following UNO’s go-ahead goal with eight minutes left. Right or wrong, Miami is starting to lose its fanbase for this season and needs to start winning or it will be playing in a half-full building during its most crucial league games when it most needs to maximize its home-ice advantage. – Off the subject, but it seems now is a good time to bring up honoring a couple more recent graduates by adding their numbers to the wall. It’s a completely Goggin-central class right now, which is understandable considering the rink is just 10 years old, but Andy Greene and Ryan Jones should have their names in the zamboni end. Both were class acts and captains as well as two of the most dominant players ever to don Miami sweaters. Greene did not play at Cady, having graduated in 2006, and Jones finished in 2008. That’s 10 and eight years, respectively. It’s time to officially honor their accomplishments. FORWARDS: C+. Some of the offensive success this group is off-set by turnovers that resulted in UNO goals. Josh Melnick uncharacteristically coughed one up for the go-ahead goal in the third, and Anthony Louis’ errant pass in the second led to the critical SHG. But those two also accounted for three goals and two assists. Coach Enrico Blasi is understandably shaking up the lines at this point. DEFENSEMEN: D. Did we mention we miss Belpedio? Even sure-handed Grant Hutton got beat by shifty Mavericks forwards a couple of times. Confusion among this group resulted in the delay of game penalty that ended up in Miami’s net for UNO’s first goal. Some of the youngsters are improving but will need to continue that process or it could be a long season in conference play. GOALTENDING: C. Larkin made a couple of strong saves, as he always does, and he had little chance on either redirection goal. The second UNO goal was on a good one-time shot from the slot that beat Larkin. The fourth and final goal scored on Larkin was definitely stoppable though. Munroe had no shot at stopping the slap-pass goal. After looking nervous on his first couple of shots, he settled in and finished 7 of 8 including a point-blank backhand that he corralled cleanly. LINEUP CHANGES: Carson Meyer was out for the first time this season, although it is unclear why (he has two goals and eight assists). Karch Bachman returned after sitting on Saturday at Western Michigan. Along with Belpedio, who likely will not play on Saturday but should be back next week, Bryce Hatten was also a scratch. Munroe replaced Larkin for the final 14 minutes, making it unclear who will be in net for the series finale. Larkin may be losing confidence after seeing so many high-quality shots recently, and he stopped just 16 of 20 in this one. Posted on November 12, 2016, in Uncategorized and tagged 2016-17 miami redhawks, analysis, NCHC, Nebraska-Omaha Mavericks. Bookmark the permalink. 1 Comment. Friday, Larkin took a hard shot puck off his arm or his side, pulled himself. Was a scratch Saturday.FYI.injury.